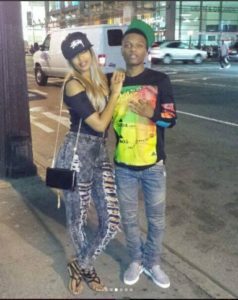 Apparently, Binta, Wizkid‘s second baby mama feels herself and her son have been unfairly treated by the Starboy. Some hours ago we reported her suggestive social media posts. After that, she put up more jarring posts about her baby daddy. TX news reported that Binta, mother of Wizkid’s son, Ayo, took to Instagram to reveal how her baby daddy has not been playing his role in the life of their son. She stated that she had to take full responsibility for their son’s welfare for 15 months before the Starboy stepped in and even when he did, he only supported with what she described as a paltry sum. Reacting to some of the comments she received, about her claims being attention-seeking schemes and that her issue with Wizkid is a result of a one night stand; Binta made an attempt to correct the notion and suggested that herself and Wizkid were more than a one time thing. She posted pictures she took with the singer when all was good between them and stated that he made her fall in love with him by telling her ‘lies’ about the tall height of his love for her. Only some days ago, the singer was subtly called out by his first baby mama, Sola Ogudugu, who made claims similar to Binta’s claim. Sola claimed that she has been playing the role of father and mother to Boluwatife, Wizkid’s first son and she deserves her accolade served chilled.